Kayseri has changed dramatically in the last quarter century. Seljuk tombs that used to seem almost in the country are now dominated by modern buildings and the great monuments round the much restored citadel are overlooked by towering blocks, including the Hilton and Radisson hotels. It was to the latter that Turkish Airlines sent me for two nights when their flights to Istanbul were cancelled because of the recent snows. Restless sightseer that I am, I had previously used Kayseri as a base for visiting the prodigious hans to the east and other neighbouring sites. In 1987 I arrived from the Hittite heartland; 15 years later I crossed the pass from Kahramanmaraş in heavy snow, reassured by a skiing instructor who had asked for a lift and reassuringly knew the road; more recently I had come from Roman Comana, which is locked in a narrow valley in the hills to the east and is still too little known. I of course saw the obvious buildings and the Archaeological Museum, but I had never spent a whole day on my feet in Kayseri. Fortified against the cold by the Radisson’s admirable breakfast, I made first for the Archaeological Museum, where, needless to say no one else was looking at the remarkable finds from Kültepe or at the less impressive classical things. I then cut across to the main approach to the city from the west, passing a number of Ottoman buildings to reach the beautiful and responsibly restored Döner Kumbet (above) the most richly decorated and arguably the finest of the many structures of the kind that surrounded the historic city. 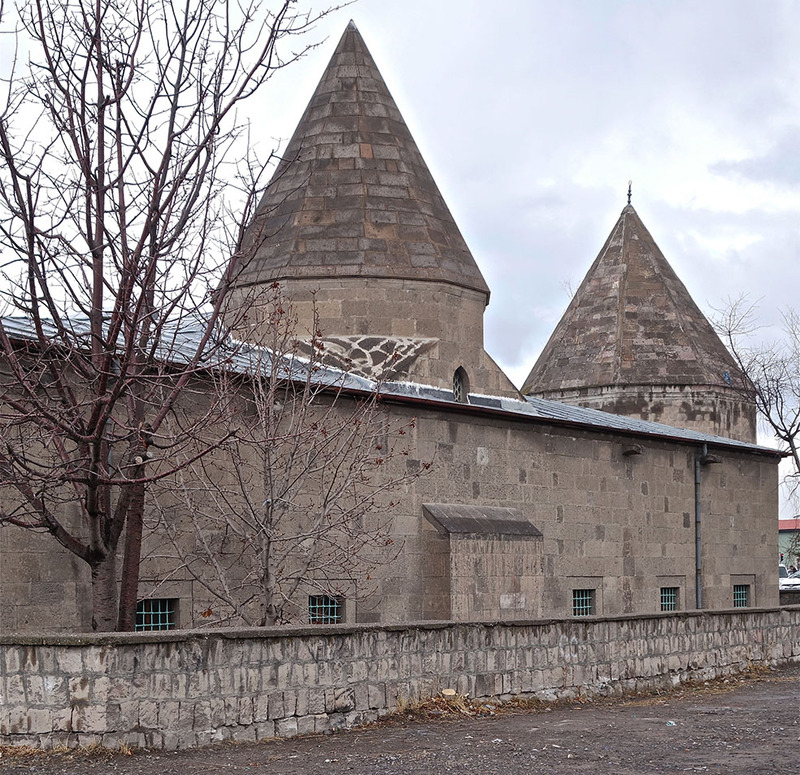 On the way, the main road passes the austere Han Mosque, initially, as its name suggests, a caravanserai, with the founder’s large, restrained tomb. Ahead is another Seljuk türbe, now an island in the middle of the dual carriageway. A horseman in armour bearing the Turkish flag passed as I approached, and the sounds of a demonstration were evident. A colourful and evidently patriotic procession was marching down the underpass below the türbe. Cameras, including mine, were brandished. The surviving sections of the city walls are heavily restored. I made for the equally restored Gürgüpoğlu House, which on my last visit had housed the Ethnographical Museum: this was fenced off, and, as I would learn, some of its finer exhibits have been moved to the new Seljuk Museum. With the exception of the house, and that occupied by Atatürk – whose sojourns in mansions throughout Turkey has saved so many buildings of the kind – almost no early domestic structures survive within the confines of the old town. The citadel itself, usually a thriving market, where once in driving snow I was reduced to buying a woolen cap, was closed. So I crossed to the Hunat Hatun complex, founded in 1239, with its great mosque and the founder’s beautiful tomb that can best be seen from within the entrance. The adjoining medrese, with its fine entrance, now houses bookshops. Much original carved decoration survives although the rather menacing animal masks on the drainheads are new. 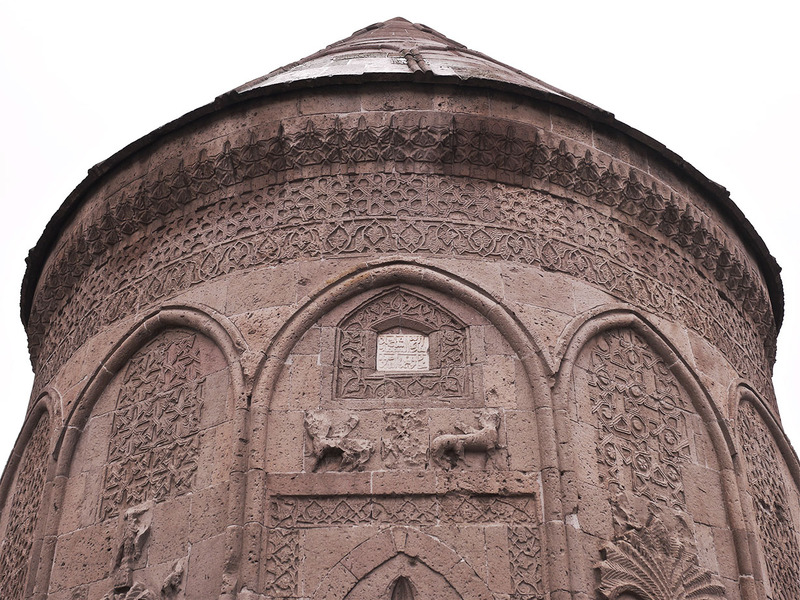 The Sahibiye Medrese further on, overlooking the central Meydan, is a Seljuk monument of almost equal distinction. 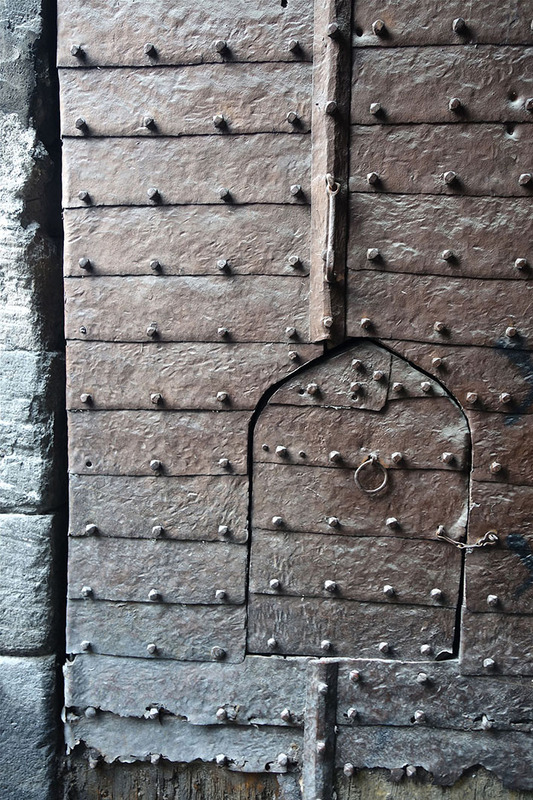 The gateway is particularly impressive, and the restorers have taken care to preserve such decorative elements as survived: this medrese too has sensibly been put to use. Beside the citadel is an ambitious modern mosque in the Ottoman tradition. I avoided this, to work my way though the market area to the Ulu Cami, an impressive if oddly unlovable building incorporating spoil from Classical and Byzantine Caesarea: a reused ‘flying Corinthian’ capital made me think of those at Aleppo. A charming adjunct of the mosque is the elegant late 18th-century Library. As it was a Sunday some of the hans were closed. The finest, the Vezir Han of 1723 (above), was open but abandoned. No doubt it will in its turn be restored, but something of its charm will inevitably be eroded. The covered market itself was fairly busy, but offers little to a sightseer other than the beautiful early fountain just outside one of the entrances. 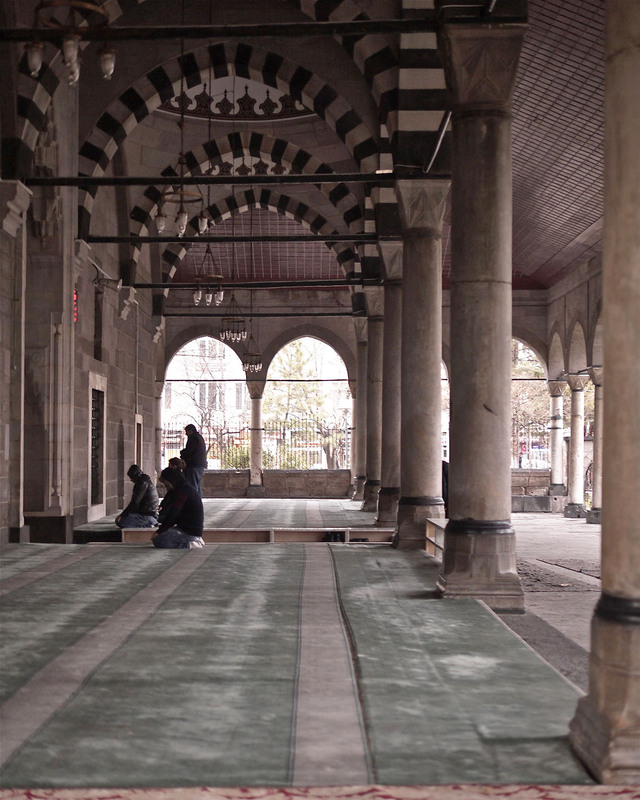 In any case there was no time to linger: I wanted to return to Sinan’s characteristically functional Kurşunlu Mosque, with its admirable portico. On then across the Atatürk Park to the new Seljuk Museum in the Çifte Medrese, the remarkable Seljuk foundation that had served as medrese and hospital. 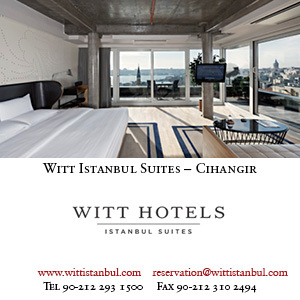 The building lends itself admirably to its new function: it boasts a distinguished collection of Seljuk ceramics – including some figured tiles from the Hunat Hatun complex – and other works of art. Old photographs demonstrate how much many of the key buildings of Kayseri have been reconstructed; while excellent modern ones draw attention to less familiar buildings. One of these made me realise that I had to see the Gülük Mosque, which, for whatever reason, isn’t so much as mentioned in the obvious guidebooks that I had with me, presumably because it is some way from the centre, and isn’t marked on any of the available maps. First I skirted the line of the former walls, before crossing to see a group of buildings that have somehow escaped the comprehensive redevelopment to which so much of Kayseri has been subjected. From these I could see a türbe and an associated mosque. The Lala Paşa Camii (above) is a restrained but archetypal Seljuk structure, the prayer hall divided by rows of arcades: although considerably smaller than the Hunat Hatun Mosque or the Ulu Camii, its very simplicity means that this is in some respects more satisfying than either. It now presides over a wasteland, part of which serves as a car park and which no doubt now awaits development. The Gülük Camii is some way to the north. The richly decorated main entrance, most unusually, is cut into the northeast corner. The interior is admirably harmonious. 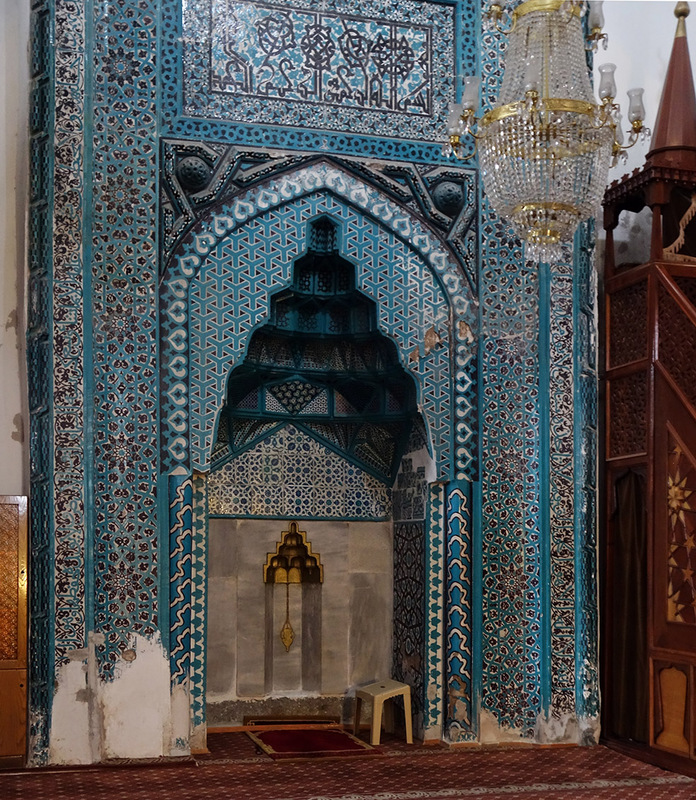 The Gülük's glory is the tiled mihrab, predominantly in turquoise, thrilling even in the dim light of an overcast winter’s afternoon. Nothing at Kayseri is so mesmerizingly beautiful. Leaving the mosque I was briefly disorientated and charged off in the wrong direction as dusk fell. So I had to retrace my steps. It was beginning, very gently, to snow, as I reached a small section of the Ottoman town that has been comprehensively restored: a hamam, a row of mansions and other buildings preserved as if in aspic for the benefit of tourists of whom none were in evidence. Had I not been able to get on a flight to Istanbul the next morning I would have returned to investigate. Dark and overcast as my day in Kayseri had been, this reminded me how much the place has to offer those who give it the time it so fully deserves. Had I known that my onward flight would let me in for total chaos at Istanbul, where neither the airport authorities nor Turkish Airlines took very effective steps to help their stranded transit passengers, I could have had a much more constructive time staying in Kayseri for another day. A new, expanded edition of Francis Russell's Places in Turkey is due to be published later this year. Read Rupert Scott’s review of the first edition of the guidebook in Issue 43.